Material has an enormous role to play in the design and development of a new product. Affecting everything from performance to price, it’s arguably the most vital consideration in the concept stages of a new project. Lighter than metal, plastic is easy to carry and transport in bulk. Rotomoulding also creates products that are allow, resulting in an even lighter finished product. Lightweight plastic components are also an economical solution for larger products, helping to reduce running and fuel costs as less energy is needed to operate and move them. Plastic is an affordable alternative to glass, metal and other materials commonly used in commercial manufacturing; its processing methods are also relatively cheap. Rotomoulding in particular is an economical process that suits one-off items and small batch runs, as well as larger orders. Plastic is resistant to moisture, temperature changes and the natural elements, making it an ideal choice of material for items that need to be long-lasting and hard-wearing, irrespective of where and how they are used. Even stainless steel can rust in welded areas, whereas plastic – of course! never will. Able to withstand most chemical components, plastics are a perfect choice for clinical and catering settings. Plastic can be cleaned thoroughly without losing integrity, and can be used in this way to prevent contamination. Food-grade plastics can help preserve the freshness and flavour of food, and, again, can be cleaned with chemicals – or at extremely high water temperatures. Rotomoulding produces seamless plastic items of a consistent thickness, helping to prevent any weak-spots from appearing. Sturdy plastic products are highly resistant to impact and will not dent easily – if extra resilience is required, the rotomoulding process can be tailored to cater to this need, strengthening the product as a whole and, in particular, any potentially high-stress areas. One of the key benefits of plastic rotational moulding is that the resulting items are durable and long-lasting, resisting chipping, rusting, degradation and fading. 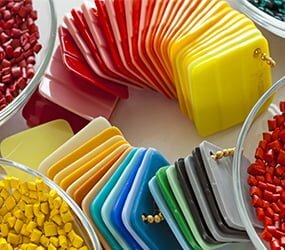 We produce plastic items in a huge variety of colours (with more available as part of our contract moulding service) that can be UV treated to ensure they stay as bright as ever, even in continuous outdoor use. This same function can be used to ensure the permanence of your logo and branding, with no chipping or peeling away – our contract moulding team can advise you on the best branding solution to suit your item. Ergonomics are a vital consideration for new products, and rotomoulding lends itself to thoughtfully designed items. The process eliminates sharp corners, burrs and rough seams, resulting in a smooth, one-piece product that is highly unlikely to break or chip. And, using CAD software, our contract moulding experts can create a 3D image of your product before the manufacturing process has even begun, helping to identify and eliminate any potential issues before they occur. Find out more about our contract moulding services and the versatile plastic products we design and create today.